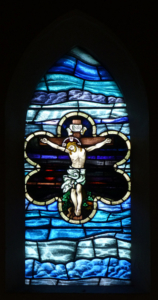 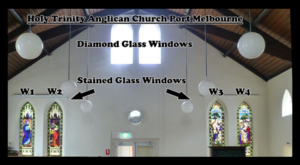 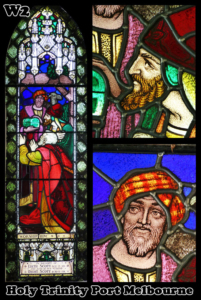 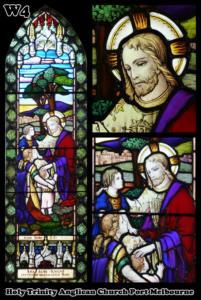 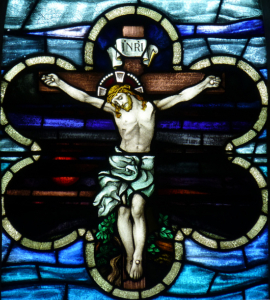 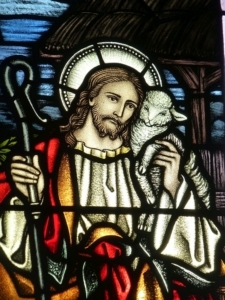 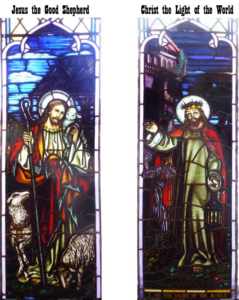 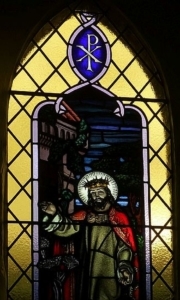 The highly esteemed Stained Glass Windows Historian Dr Bronwyn Hughes has written an illustrated description of the beautiful stained glass windows of Holy Trinity Anglican Church in Bay Street, Port Melbourne. 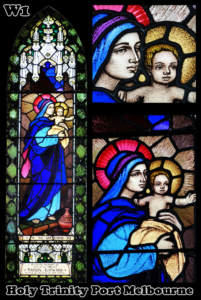 Click HERE to download your own printable PDF copy which Dr Hughes has kindly made available. 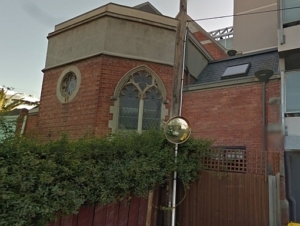 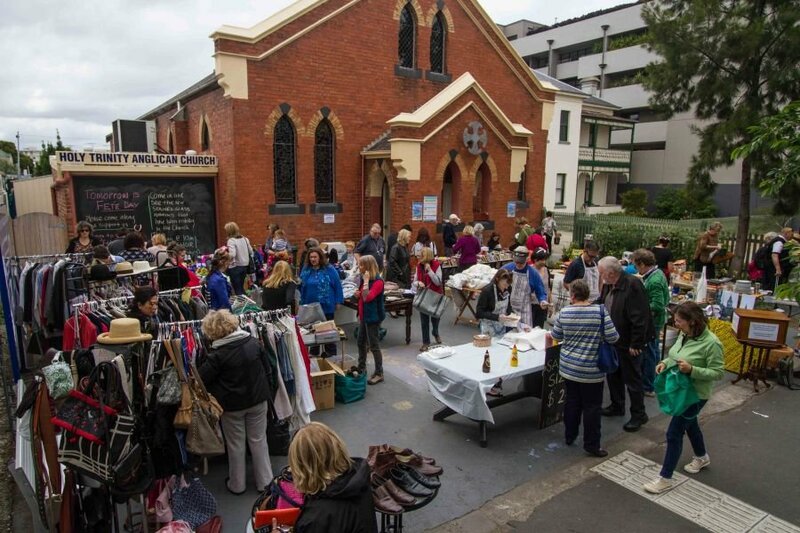 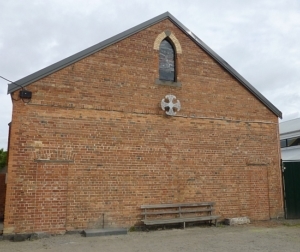 In 2013, some of the stained glass windows from the closed Holy Advent Anglican Church, Armadale (in Melbourne) were passed on to the Holy Trinity Anglican Church in Bay St Port Melbourne. 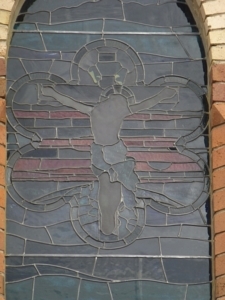 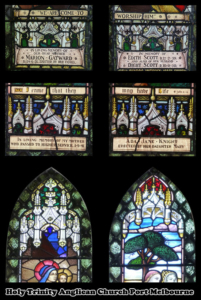 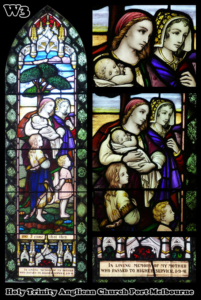 Supported by a generous donation, the exteemed firm Geoffrey Wallace Stained Glass from Caulfield Junction, removed two pairs of narrow lancet windows, added stained glass elements to the sides to adjust them to the existing wider lancet window spaces in Holy Trinity, and completed the installation in November 2013. 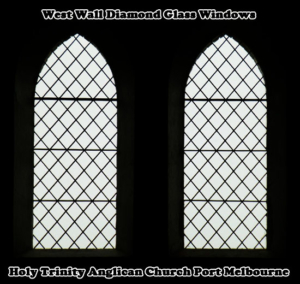 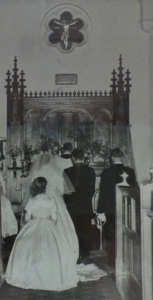 The results are celebrated with this page in the Holy Trinity Anglican Church Port Melbourne website. 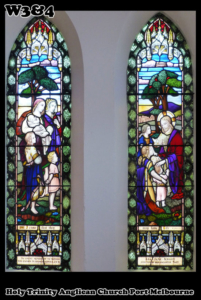 This beautiful window has now been installed above the altar and is a magnificent gem in the sanctuary. 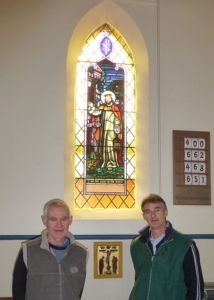 Thank you to Andrew and Peter Fergusson, the stained glass window artists who remodeled and installed the window. 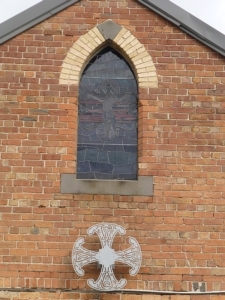 Grateful thanks to the parish of St Bartholomew’s Burnley, for returning the window to its original home. 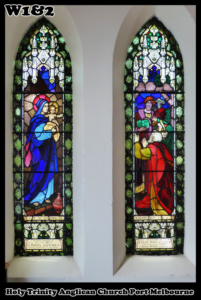 Donations towards this project would of course be most welcome. 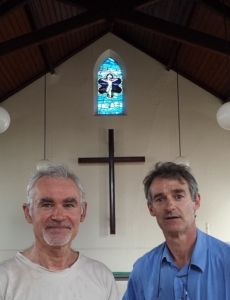 Peter & Andrew Ferguson of Ferguson Stained Glass following their completion of the installation of the East Altar Stained Glass Window from the original Holy Trinity Church in Port Melbourne. 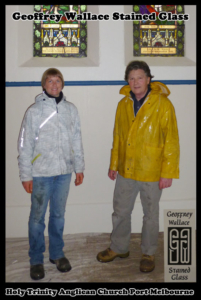 A wonderful homecoming!